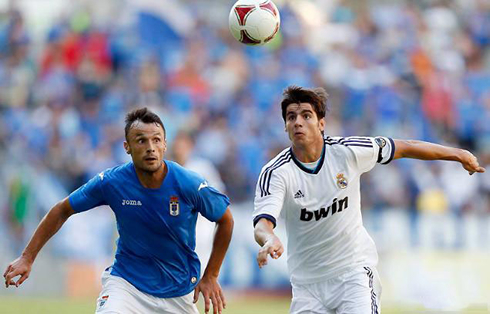 The pre-season games have started this Tuesday for Real Madrid, with the first test being against Real Oviedo. 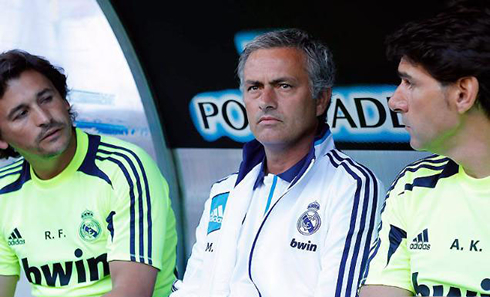 The result was positive, as the Spanish champions pulled off a victory by 1-5. The Merengues presented a squad with plenty of "Canteranos", but they all showed that José Mourinho's philosofy and thirst for goals is transversal within the club. Ronaldo arrives this Saturday and will also miss this Friday's game against Benfica. Real Madrid faced and defeated Oviedo by 1-5 this Tuesday afternoon, on the first pre-season game to help the club getting prepared for the upcoming season. With several players (including Ronaldo) still unavailable to give their contribute, due to extended vacations after the EURO 2012, José Mourinho picked several youngsters from the Real Madrid "cantera" and the outcome was quite positive against a 2nd division side as it is Real Oviedo. Lucas, Denis Cheryshev, Granero and Angel di María (twice) were the goalscorers for the Merengues and the team will now travel to Lisbon where they are expected to face SL Benfica this Friday night. Cristiano Ronaldo meets the team precisely the day after and should be in time to travel with the squad to the United States tour. Even though Oviedo isn't exactly what we can call a very tough opponent, if we have in mind the amount of players Real Madrid still can't count with and the fact that José Mourinho benched most of the remaining usual starters, we're forced to say that the Real Madrid youngsters gave an excelent answer this Tuesday night. The first half ended with a clear 0-3 result on the score line, leaving no room to dispute about who has been the better side on the pitch. The first player opening hostilities with a Real Madrid shirt this season was Lucas, followed by the Russian player, Denis Cheryshev, then Esteban Granero and finally Di María. They all helped assuring that the Merengues are here to take every match by storm this season, may those be simple friendlies or serious competitive games. Oviedo managed to even things up for a bit during the second half, as they cut the lead to 1-3 right after the break. However, Mourinho had sent in to the pitch several first squad regulars such as Gonzalo Higuaín, Di María, Callejón or Diarra and the Merengues would easily extend the lead into 1-5, as the second half unfolded. The Argentinian Di María scored a brace and will probably be one of the starters this Friday night, when Real Madrid visits Benfica in the Estádio da Luz, precisely Fábio Coentrão and Di María's previous club. Real Madrid began pre-season trainings on the 16th of July. Cristiano Ronaldo is expected to join his teammates later this month, on the 28th of July, after being granted with a few more days of vacations. Cristiano Ronaldo will miss at least the first two pre-season games, including the next one between Benfica vs Real Madrid, which you can watch from our football live streams section. In the meanwhile, you can also watch Roma vs Liverpool, Shanghai Shenhua vs Manchester United and the MLS All Stars vs Chelsea.